Paul Oakenfold is probably the world's most famous DJ. He's certainly one of the busiest. After a weekend of driving hundreds of miles, Tim Barr finally managed to catch up with him. From The Spectrum to remixing U2, Tim gets it all. It's six o'clock on a Saturday morning. I'm fu*ked. I've been waiting around The tunnel, Glasgow's glitzy, glamorous and seriously up-market take on the warehouse aesthetic for over seven hours. Waiting for Paul Oakenfold to slot in the interview we'd scheduled for eleven the previous evening. It isn't going to happen. Adam, his driver, has said so. So there's me, and Sweeney the photographer, cooling our heels, wasting our time. We could’ve been up at The Arches, or at Cool Lemon. Instead we're at The Tunnel and it's not gonna happen. "Phone me at one", says Paul. "We'll do it then." We don't – he's too busy. "Come out to The park", he suggests. "We'll do it there." We don't – he's too busy. "Should've got your sh*t together", he says helpfully. "I told you we should've done it Friday night!" He'd been late. It was only to be expected. I should have seen it coming. I'd just done a week of interviews with other DJs. Problem-free. No hassle. It had to go wrong sometime. I'll admit I was nervous though. Oakenfold, after all, is the man widely credited, along with Nicky Holloway and Danny Rampling, for kick-starting the scene in the country. The man who gave U2 a worldwide hit with his sparkling, shiny remix of 'Even better Than The Real Thing'. A DJ who's played everywhere including one set, in Naples, where he stood up and did his thing in front of 95,000 people. He rubs shoulders with superstars and record company executives like Max Hole from East West, who's just signed Oakenfold's Perfecto Records for major money. Now, along with partner Steve Osborne, he's also the man responsible for a stunning new release on Perfecto which goes under the name of Rise and is simply called 'The Single'. A full-on hard'n'fast work-out, it's further evidence of Oakenfold's current enthusiasm for the sound of Goa, the melodic trance/techno fusion promoted by the likes of Dino and Mike Maguire. It's the reason Paul Oakenfold is now in the offices of his record company, a fortnight after our first encounter, finally sitting still for interrogation. Neither of us mention our previous attempts. I don't see the point. He's probably forgotten. It's not an auspicious start. Things are running late already. He's got eleven interviews to do today, he tells me, and I'm slap-bang in the middle. It's a punishing schedule. While we're talking, he turns to ask his press officer a question, eager to get things over and done with. This isn't an intimate chat. It's a production line. Paul Oakenfold, you see, is a busy man. And it must be getting tedious. He’s been on this roller-coaster for thirteen years now, ever since he began helping Trevor Fung carry the record boxes which were to become his passport to the big time. "I owe a lot to Trevor Fung," he says. And he means it. It was Fung who gave him his first professional DJ spot at Rumours in Covent Garden. From here, things spiralled ever upwards. A trip to Ibiza was the real turning point, though. Introduced to the burgeoning Balearic scene, he brought it back to England with him. The rest, as they say, is history. Involvement with Manchester's terminally hip bad boys, Happy Mondays, followed, launching Oakenfold on a flourishing career as a name remixer. "Credit where credit's due," he explains. "Alfredo was the DJ who started the Balearic thing. I'd been going to Ibiza since 1983. At the time, we were running a small club in South London and, in 1987, we invited, and paid for Alfredo to come and play there. That was the first party of its kind in England. Then we went on and opened up a club called The Future. From there, Danny Rampling opened Shoom, and then we had Spectrum. 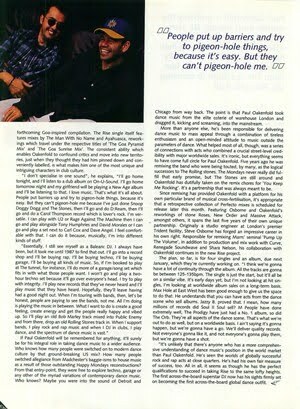 Happy Mondays were part of what was going on in The Future, because we were playing their records next to The Cure, next to Public Enemy alongside acid house. We were playing Balearic in the true form, which is the best kind of music mixed together. Rock records didn't really work as well as they could've, so the next step was to go into the studio with the master tapes and remix them so that they worked for the clubs. It just progressed from there. Oakenfold moved from remixing into production with Happy Mondays, while still proving his versatility with mixes for everyone from Massive Attack to INXS. He set up Perfecto Records which gained a chart hit for former Land of Oz compadre Carl Cox and notched up the credibility ratings with Robert Owens' classic 'I'll Be Your Friend'. All this alongside establishing a career as one of the world's most in-demand DJs. He played in London, Bangkok and Singapore in the space of one weekend. And it's still going on. He's just finished touring with Rage Against The Machine, completed remixes for Snoop Doggy Dogg and The Rolling Stones and, somehow managed to find the time to finalise the deal with East West. It's been a long haul. thirteen years, in fact. He's been involved in every facet of club culture and been successful at it. After all of this, doesn't he find his motivation, his eagerness to get up behind yet another set of decks slightly dented? "It's funny," he ponders. "At the weekend, I was talking about that with a friend of mine. He's lost interest in it. Basically, there's nothing you can do if, musically, you're not turned on by what's out there, and, let's face it, there's enough out there. I think if that happened to me, then it'd be time to hang up my hat and finish DJ-ing. But, at the moment, I absolutely love it. I really look forward to going on. There's the great new Goa scene that's starting to develop and there are great, young DJs who are coming out of that scene. It's great just to go and listen to, even if you're not DJ-ing. It reminds me of the Ibiza scene – the spirit and the energy and the openness of the people. The people, especially. It's the same feeling that I got when we were in Ibiza in '86/'87 that I've got now. It's this enthusiasm that has led to Paul selecting tracks for a forthcoming Goa-inspired compilation. The Rise single itself features mixes by The Man With No Name and Ayahuasca, reworkings which travel under the respective titles of 'The Goa Pyramid Mix' and 'The Goa Sunrise Mix'. The consistent ability which enables Oakenfold to confound critics and move into new territories, just when they thought they had him pinned down and conveniently labelled, is what makes him one of the most unique and intriguing characters in club culture. "I don't specialise in one sound", he explains, "I'll go home tonight, and I'll listen to a dub album on On-U-Sound. I'll go home tomorrow night and my girlfriend will be playing a New Age album and I'll be listening to that. I love music. That's what it's all about. People put barriers up and try to pigeon-hole things, because it's easy. But they can't pigeon-hole me because I've just done Snoop Doggy Dogg and The Stones, then I'll go and do D:Ream, then I'll go and do a Carol Thompson record which is lover's rock. I'm versatile. I can play with U2 or Rage Against The Machine then I can go and play alongside Tony Humphries and David Morales or I can go and play a set next to Carl Cox and Dave Angel. I feel comfortable with that. I can do it because, musically, I'm into different kinds of stuff. "Essentially, I still see myself as a Balearic DJ. I always have been, but it took me until 1987 to find that out. I'll go into a record shop and I'll be buying rap, I'll be buying techno, I'll be buying garage, I'll be buying all kinds of music. So, if I'm booked to play at The tunnel, for instance, I'll do more of a garage/song set which fits in with what those people want. I won't go and play a two-hour techno set because it'll go over everyone's head. I try to play with integrity. I'll play new records that they've never heard and I'll play music that they have heard. Hopefully, they'll leave having had a good night out. When I'm touring with bands, then, let's be honest, people are paying to see the bands, not me. All I'm doing is playing the music in between. What I want to do is create a good feeling, create energy and get the people really happy and vibed up. So I'll play an old Bob Marley track mixed into Public Enemy and from there, drop an old Rolling Stones track in. When I support bands, I play rock and rap music and when I DJ in clubs, I play dance, and the spectrum of dance music is vast." 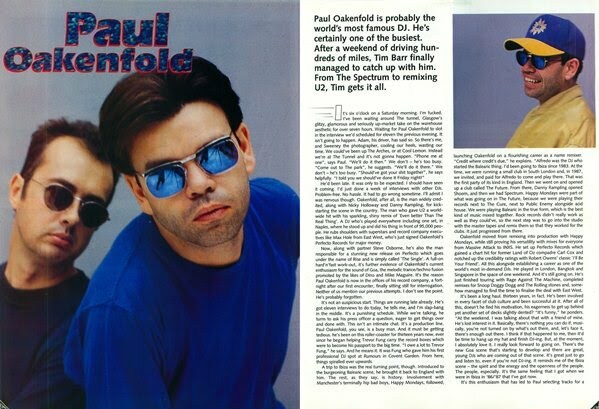 If Paul Oakenfold will be remembered for anything, it'll surely be for his integral role in taking dance music to a wider audience. Who knows how many people were switched on to modern dance culture by that ground-breaking US mix? How many people switched allegiance from Madchester's baggie-isms to house music as a result of those outstanding Happy Mondays reconstructions? From that entry-point, they were free to explore techno, garage or any other of the myriad variations of contemporary dance music. Who knows? Maybe you were into the sound of Detroit and Chicago from way back. The point is that Paul Oakenfold took dance music from the elite coterie of warehouse London and dragged it, kicking and screaming, into the mainstream. 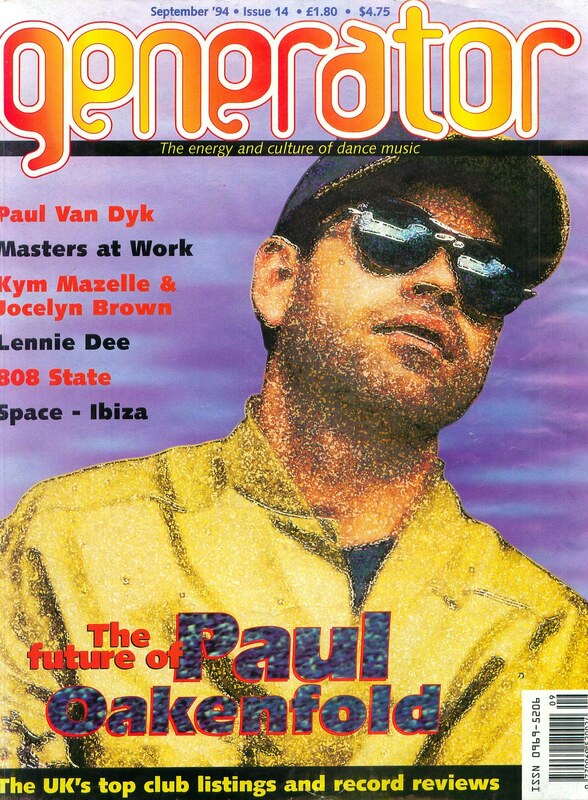 More than anyone else, he's been responsible for delivering dance music to mass appeal through a combination of tireless enthusiasm and an open-minded attitude to music outside the parameters of dance. What helped most of all, though, was a series of connections with acts who combined a crucial street-level credibility with major worldwide sales. It's ironic, but everything seems to have come full circle for Paul Oakenfold. Five years ago he was remixing the band who were being touted, by many, as the logical successors to The Rolling Stones. The Mondays never really did fulfill that early promise, but The Stones are still around and Oakenfold has dutifully taken on the remix chores for 'You Keep Me Rocking'. It's a partnership that was always meant to be. Since remixing has provided Oakenfold with a platform for his own particular brand of musical cross-fertilisation, it's appropriate that a retrospective collection of Perfecto mixes is scheduled for release later this month. Featuring Osborne and Oakenfold's reworkings of stone Roses, New Order and Massive Attack, amongst others, it spans the last five years of their own unique partnership. Originally a studio engineer at London's premier Trident facility, Steve Osborne has forged an impressive career in his own right. Responsible for remixing Marrs' seminal 'Pump Up The Volume', in addition to production and mix work with Curve, Renegade Soundwave and Shara Nelson, his collaboration with Oakenfold continues in the new Rise project. The plan, so far, is for four singles and an album, due next January, which they're currently working on. "I think we're gonna have a lot of continuity through the album. All the tracks are gonna be between 125-135bpm. The single is just the start, but it'll all be on a similar vibe. It's early days yet, but I'm not looking at hit singles, I'm looking at worldwide album sales on a long-term basis. Max Hole at East West has been good enough to give us the space to do that. He understands that you can have acts from the dance scene who sell albums. Jazzy B. proved that. I mean, how many millions of records did Soul II Soul sell? M People have done extremely well, The Prodigy have just had a No. 1 album, so did The Orb. They're all aspects of the dance scene. That's what we're out to do as well, but on a worldwide basis. I ain't saying it's gonna happen, but we're gonna have a go. We'll deliver quality records. Not everyone's gonna like it, and not everyone's gonna play them, but we're gonna have a shot. "It’s unlikely that there's anyone who has a more comprehensive understanding of dance music's position in the world market than Paul Oakenfold. He's seen the worlds of globally successful rock and rap acts at close quarters. He's had his own fair measure of success, too. All in all, it seems as though he has the perfect qualifications to succeed in taking Rise to the same lofty heights. The first across-the-board superstar DJ now has his sights firmly set on becoming the first across-the-board global dance outfit.